50% Of Users Watch Business Related Videos On YouTube Once A Week (digitalsherpa). Video, because of its unique qualities is perhaps the most effective way to engage people in our increasingly mobile and on-the-go society. With people less likely to be motivated to read your company or product promotional material, now is the time to take advantage and drive sales with video marketing. If you’re still on the fence about video, here’s one more statistic to think about before making the jump. A professional company overview or product promo video not only helps to engage existing traffic, it can also expand your reach by attracting new prospects. Videos serve as an engaging introduction to prospects who are conducting online research, and are a great way to boost brand awareness. Producing a video that creates a positive impression and encourages people to share via social media presents a potential for exponential growth in leads. Corporate promos and technology demo videos with proper tracking implemented allow you to get a more precise understanding of who is viewing your content. Properly implemented analytic tools allow you to drill-down to meaningful information such as when, where, and from what device they watched your video. Your sales and marketing teams can then use this information to optimize and more efficiently deliver targeted messaging. This insightful data will also prove invaluable to your sales team when determining which prospects are not only the most interested in your product or service, but also the most likely to make the purchasing decision. With a relationship established your reps can add value with a video series they can distribute helping new customers harness the full potential of your solution. By providing value to your customers through tools like product demos and tutorials, you empower them while encouraging a sense of loyalty. Empowering and encouraging your customers with helpful, share-able video can lead to lasting partnerships with powerful advocates that introduce your brand to an ever growing number of prospects. 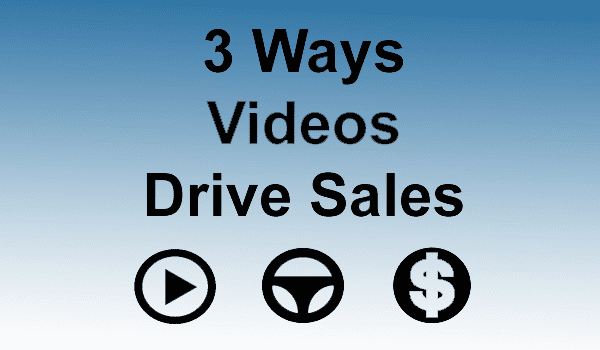 If you are ready to leverage video to support your sales team and drive sales, contact us today! One of our experts will gladly answer your questions and help determine the best video option for your organization.